Art journaling is a great way to creatively interact with the Word of God. The ESV Illuminated Bible features illustrations by renowned lettering artist, graphic designer, and illustrator, Dana Tanamachi. Features of the ESV Illluminated Bible include 9-point text size, black letter text, 2-color printing, 64 full-page custom book opener illustrations, 50 full-page verse illustrations, 250+ hand-lettered margin versus, and 100+other illustrations throughout. Printed on thick cream-colored paper, the Bible's single-column text setting and wide margins provide generous space for additional notes, prayers, and designs, welcoming readers to creatively engage with and reflect on the beauty of God's word in their own way. Overall, the ESV Illuminated Bible is made very well. It features a cloth over board cover and is a little bit heavier than your standard Bible, one reason being that the pages are a little bit thicker. This Bible also comes in a matching box to provide extra protection when being stored. The illustrations are absolutely magnificent...quite mesmerizing really, especially the title pages. There is an adequate amount of room on each page where you can add your own notes, prayers, quotes, designs, etc. There is also an index of title pages in the back of the Bible and a short description, telling you the meaning behind each illustration. Overall, this is an incredibly beautiful Bible and would make a great gift for the Christian in your life. 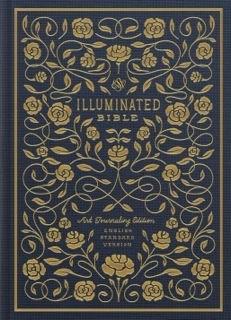 You can purchase a copy of the ESV Illuminated Bible on Amazon here: https://www.amazon.com/stores/page/060FAE2C-365C-4591-87C0-39ADAC08D5E9. I am giving away a copy of this ESV Illuminated Bible to one resident of the continental U.S.
John 5:15 And if we know that he hears us—whatever we ask—we know that we have what we asked of him. Roman 12:12. To give us hope and patience in conflict or affliction. This helps me when I feel down. I haven't owned a Bible since I was a child. This would be a wonderful addition. My favorite verse is "the lord is my light and my salvation"
When I was young, I had a Precious Moments Bible and I would spend hours looking at all the pictures! Such a promise. He is so faithful. I love using the ESV! My favorite passage right now is 2 Chron 20:3-17. Philippians 4:16 is my favorite verse. My favorite Bible verse is Mark 12:30. I still love John 3:16 even as an adult. I recently became interested in Bible journaling and thought it would be a wonderful way to sit down with the Lord and have some quiet, reflective time while enjoying my creative side! I can see myself waking up a little earlier to grab some quiet time while my toddler still sleeps so I can devote this time to the Bible. When I began searching for the perfect journaling Bible, I noticed that this Crossway Illuminated Bible was to debut in just a few weeks! So, I waited, and then stumbled upon this giveaway! I hope to win a copy of this Bible so I can continue my walk with the Lord in a creative way. The gorgeous details and designs will inspire my own artwork and designs as I study the Word! Thank you for this opportunity! What a beautiful way to portray Scripture!! I love Colossians 1, John 1 and Hebrews 1!!!! John 3-16 For God so loved the world he gave his only begotten son! I went to Confirmation classes as a young girl and now am 66 and still remember a lot. My parents gave me a lovely Bible when I was confirmed. It has meant so much to me through the years. My favorite bible memory is the one of the bible I have today. It belonged to my great-great grandmother and has been handed down to me. It means so much to me as makes me feel so connected to those who had it before I did. My favorite Bible verse is Psalm 55:22. Just wondering if there was a winner for this giveaway?